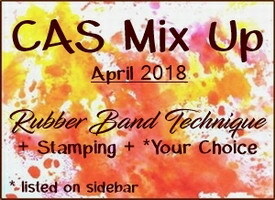 CAS Mix Up April Challenge - click HERE. Hi everyone. Earlier I posted a video on the Rubber Band Technique. Click HERE to watch it on YouTube. I made the video for the CAS Mix Up April Challenge - Rubber Band Technique. The challenge is open until April 24th. Come join us!! In the video, I showed several different cards that I made with this fun and easy technique. 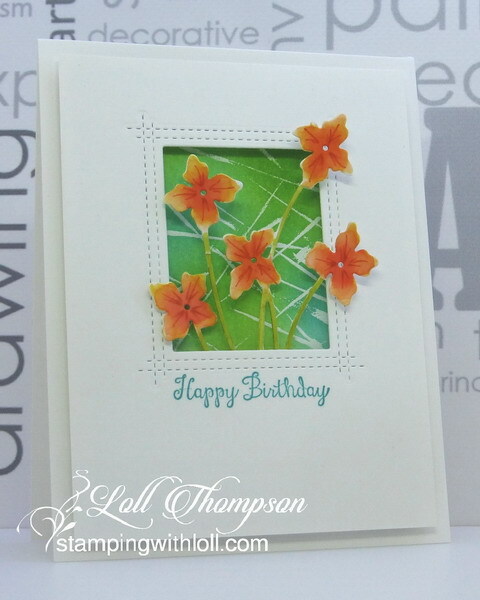 In this post, I'm sharing the details of how I made the cards and the products I used. Wrapped two elastic (rubber) bands around my acrylic block. Pressed the block into my Versamark pad and lightly stamped onto my mixed media card front. Trick is to press lightly enough to transfer the ink from the elastic bands, without transferring any residual ink that sits on the block. Sprinkled with white embossing powder and heat set. Sponged green and blue inks randomly over the heat embossed area. Die-cut the blooms from watercolour paper and used distress inks to watercolour. Die-cue the window from the card front and place on top to align the blooms. Attached blooms to the back of the window card front and popped it up over the background. This gives some space between the flowers and the background. Stamped the sentiment in Peacock Feathers to match. Wrapped two elastic (rubber) bands around my acrylic block. Pressed the block into my Versamark pad and lightly stamped onto my mixed media card front. Trick is to press lightly enough to transfer the ink from the elastic bands, without transferring any residual ink that sits on the block. Sprinkled with white embossing powder and heat set. Sponged green and blue inks randomly over the heat embossed area. Spritzed with a little water and used a water brush to move the colours around. 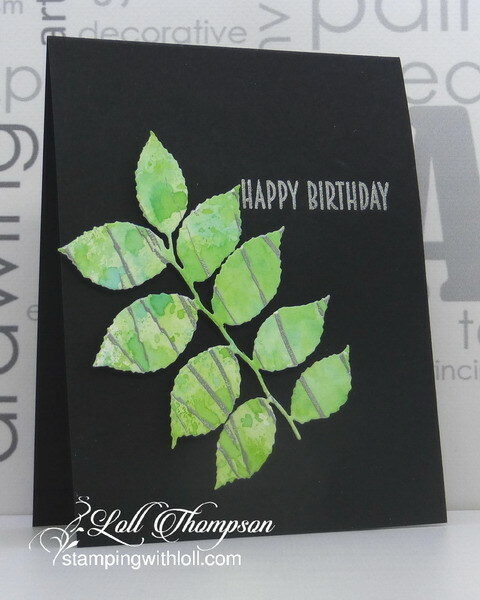 Made sure the card front was dry before adding the black die-cut leaves and white heat embossed black sentiment banner. Wrapped two elastic bands around the barrel of a brayer and snapped it into the handle. Rolled the brayer across a Versamark pad several times to make sure the ink was on the elastic bands all around the roller. Rolled the brayer in one direction across a piece of mixed media. Reloaded the brayer and continued to roll across the paper until the whole sheet was inked (one direction only). Sprinkled with silver embossing powder and heat set. 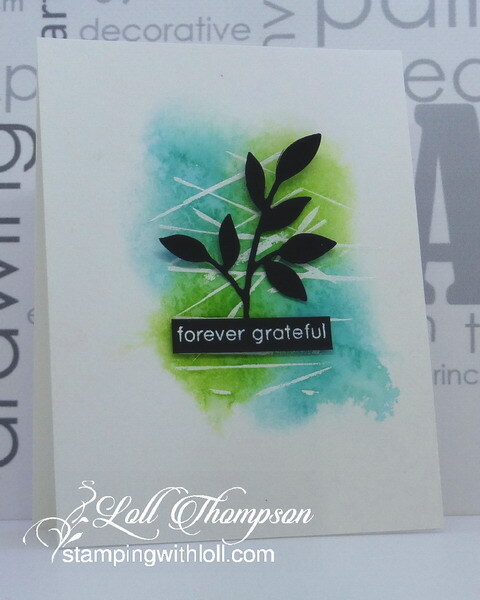 Pressed some green and blue inks onto my craft mat, spritzed with water and "splashed" the embossed card, using the Splash Watercolour Technique, click on link to see video tutorial. Let dry and die-cut the leaf. Adhered the leaf to my black card base, popping up the top leaves and gluing the bottom of the stem and two bottom leaves flat onto the card. Stamped the sentiment and heat embossed in silver. Wrapped two elastic bands around my brayer and loaded with Versamark ink. Lightly rolled over my Mixed Media card stock in one direction, re-inking after each swipe. Heat embossed in silver. Used the Splash Watercolouring technique to add green and a little blue to the background of the rubber band embossed piece. When dry, die-cut the framed fern. Die-cut a second framed fern in white and then inlaid the design with the splashed background. Stamped gorgeous grunge several times behind where I wanted my panel to go, as well as stamping the sentiment and then heat embossed everything in silver. Popped the panel over top to finish. Wrapped two elastic bands around brayer, loaded with Versamark ink and rolled diagonally over a piece of mixed media paper, re-inking the elastic bands after every swipe. Repeated with rolling diagonally in the opposite direction. Poured white embossing powder over top, tapped off excess and heat embossed. Die-cut palm tree from black card stock. Cut main panel to size that looked good with the tree die, sponged over top of the white embossed lines randomly with yellow, orange and pink. Popped the panel over top of the card base and glued the trees on top. Stamped sentiment in black. 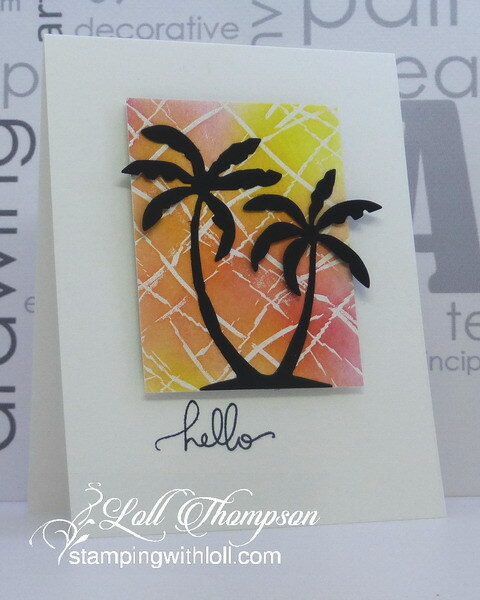 Started with the same background as the Hello Palm Tree card. Brayered versamark on mixed media paper with rubber bands diagonally in both directions. Heat embossed in white. This time used the Splash Watercolour Technique to add the same colours to the background ... yellow, orange and pink. 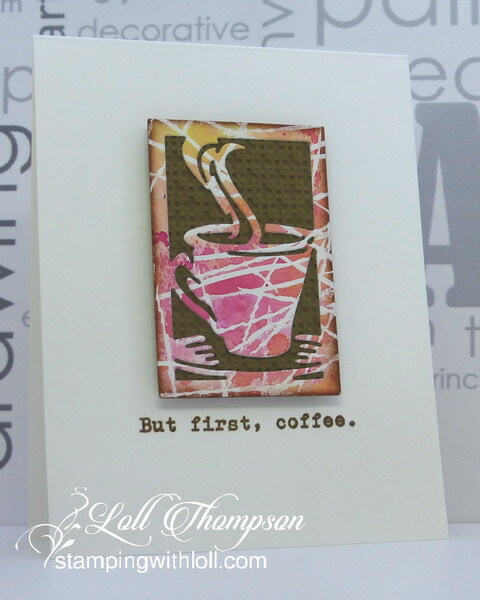 Once dry, die-cut the coffee cup, sponging around the edges with Soft Suede ink. 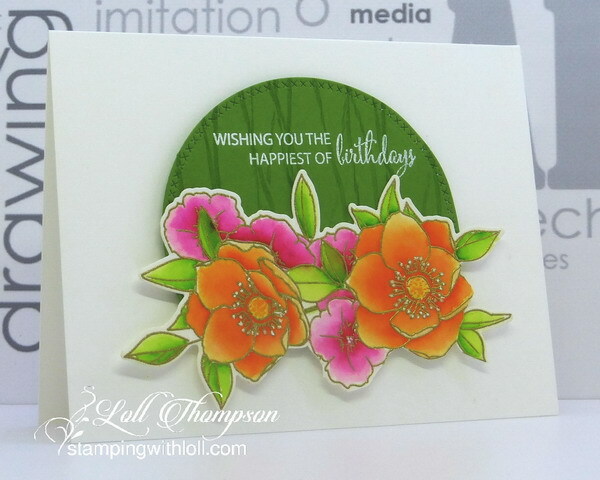 Glued to a embossed soft suede card stock background that had been trimmed to size. Popped the panel up on the card base. Added a sentiment stamped in soft suede ink. Started by heat embossing my flowers in gold and watercolouring with zigs. Used only a portion of the image, cutting off the rest to use later. Die-cut the partial circle from green cardstock. Wrapped two elastic bands around my brayer, rolled it over a green ink pad (matches card stock) and then lightly rolled over the green card stock Gives a lovely tone-on-tone design. Stamped the sentiment in white pigment ink and heat embossed. Popped the partial circle over top of the card base. Popped the flower up over top of the partial circle. Oh my goodness Loll! I love your cards!! you have been busy my friend : ) I can't wait to watch your tutorial!! Thankyou for sharing! Brilliant and beautiful! I can't wait to see what you create out of the piece from the video that was gold with sparkle embossing powder!!! You had an extremely busy time in March :-) So many amazing cards for one opening CMU challenge !!! Thank you for another great technique, great movies and such a great inspiration. I must try it! WOW! I was left without words because of the beauty of your cards. The most I love is the first card from which these beautiful orange flowers look from the green window. I love this card! I love all the cards you made this the rubber band technique, Loll, and I'm definitely trying it. What fabulous examples you made for your video!! They really show the wide range of uses for the rubber band technique. Thanks for the details on how you made them all. I especially love Hello Framed Fern and Happy Birthday Flowers. Oh Wow did I enjoy seeing these incredible designs with another of your unique and imaginative techniques. I DO remember your video and thank you for jogging my mind. Love the backgrounds on these- so perfect for a die cut. I still love seeing your color combinations too. These are beautiful, Loll! An entire bunch of beauties, Loll! What a fantastic and easy to do technique! I have certainly stamped with rubber bands before, but not thought to use them on a brayer. That is a neat twist on the technique! Thanks for sharing. All your cards are lovely. Oh My Goodness! What a wonderful wealth of pretty & unique cards using this fab technique (and I forgot the video went live yesterday, so will be off to enjoy it shortly! 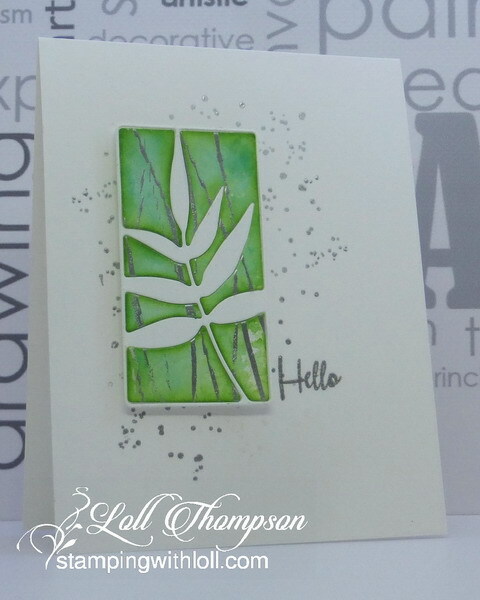 )Loved the leaf made from the technique, and all the gorgeous backgrounds too. Must confess #1 was going to be my fav of all the great looks..UNTIL I got to the last one! I was ooh-&-aah over each one! TFS & have a great week. OMG, you went all out Loll. So many perfect beauties as I scroll down. Great video too, loved it! WOW! What a bevy of beauties, my friend! Not only is your video spot on and informative, but each of your samples is unique and beautiful too! So much to inspire us, Loll...Your cards are beautiful! I really like this technique and I'm glad to see how versatile it is with various designs! Thanks again for the video...I would like to try this fun technique! Great to see the gorgeous cards from the video in large! Love all the different looks you've achieved using the same, basic technique!